I also brought this basket, which is featured on the cover of the book. That was fun! Everyone really enjoyed getting to touch the projects as they actually appeared in print. This is the hunting lodge that was converted into part of the biological field station. It's right alongside the lake, so there are lots of trees here. The lake has some sandy bits, some rocky shore, and a lot of drift wood. Cold weather was coming, so there was a big breeze off the lake and that made waves. The drive from the field station to the city is about 70 miles or so and an hour and a half. It takes some time to drive on the gravel roads, which require lower speed limits. I stopped along the side of the road from the field station to take photos of the prairie. This is what the road looked like, it's built a tiny bit above the actual landscape. These fields were being used for hay; other fields had crops which were already harvested or being harvested. The combines used in field work can shoot great clouds of dust and dirt in the air if the soil is dry--you can see these clouds for miles. It looked a bit like a fire until you got close. This is what one of the drier fields looked like--there are great shades of color from black earth to dark green to hay color. There are also fields of sunflowers, canola, flax, hemp, and grain. The yellow car is mine--I was trying to shoot all the angles I could see without blowing away. It was a breezy day. When I got onto the Trans-Canada highway, speeds increased. Even so, there wasn't a lot of traffic on a Sunday afternoon. So, I was able to look at the window and noticed a train crossing the prairie. If you click on this photo, you'll see how long this freight train is...longer than the photo! I shot the photo through my windshield, while driving home. On a sunny day, the sky is blue and the clouds skid by...the horizon lasts forever and there is such an open beauty to the landscape! While the city looks like, well, a city--you can drive out just a few miles and see the prairie come back into control again. More about knitting and a story about our (great big) small world in the next post! We're still so busy with settling in, doing job and household and moving stuff that not a lot of fiber arts are getting done. However, I do have this one bobbin of gray Romney/Border Leicester cross/gray mohair yarn to show off. I've also knit some socks recently, they might get a chance on the blog sometime as well. However, people still need to eat around here. Winnipeg has great bakeries. That said, we're spending a lot of money on eavestroughs and other home repair issues...so it's back to baking our bread as it's less expensive. That is, in part, because I found a bag of all-purpose white flour, milled in Manitoba, at an unbelievable price. So, 10 kg or 22.5 lbs of locally grown/processed flour for...$8.97 Canadian. Practically free. It's not organic, but gosh, it IS local! I made some bread. For months, I have been trying not to share any of the projects in Knit Green. They are all meant to be a surprise and to be shown off when the book comes out. I've been trying hard. I'm absolutely terrible at keeping secrets. Most of the projects and the samples are safely tucked away, but I've been wearing a couple of things, and there are some dog toys that I just let Harry and Sally have. They love these handknit toys out of organic yarns, and carry them around constantly. I recently snapped this photo of Harry with his handknit, handfelted bone. The last time we were in Crete, in 2006, I wrote this post. It said a lot of reflective things. Surprisingly, I found myself getting ready to post something very similiar, so I'll be quoting some from that post this time! In Chania, and in Crete generally, there are layers of history, religion, and culture. They appear like this door--an entryway into a past and a history that is hard to understand for a person from the New World. This doorway (probably to a Venetian townhouse, or maybe Ottoman era?) is chained, but you can see right inside the building. The building is basically abandoned and in ruins. It's empty, just waiting to be restored...and since it's a townhouse, there are thriving businesses and houses right near by. It's part of the magic of Crete. Honestly, I can't figure why the new holiday homes are being built far out of town when there are places like this left to be restored right in town! **Baruch Dayan Ha-Emet is Hebrew. It means, "Blessed is (G-d) the righteous Judge." It's said in traditional Judaism whenever one hears of a death--because only G-d decides when it is someone's time to die. The synagogue was immediately looted and taken over by squatters. Over the years, there were stray animals, a chicken coop and dumps on the site of this congregation. In the mid to late '90's, an international and local inter-faith effort was made to restore the synagogue, because without this restoration, the Nazis would have succeeded--erasing thousands of years of Jewish ritual and culture." This time, we returned to visit the building again. I'd found it an extremely moving place. Somehow, one could sense the centuries of people who'd been there, worshipping, celebrating with family and friends, and mourning, too. "Generally, Jews bury their dead in cemeteries away from places of worship, but during a time of political unrest, several very esteemed rabbis were buried in one of the courtyards within the walls of the congregation. The date of the earliest seems to be 1710, and we were able to visit this grave, too." "There are now daily prayers again with mixed seating, and it's a peaceful sanctuary, sheltered in a verdant courtyard. There's an old alcove in the wall for ritual handwashing." "There are very few Jews in Crete now. The area around the synagogue was, at times, a ghetto where Jews were forced to live, but while the old buildings still remain, there are no traces of that civilization left." "I was really touched, enriched, and affected by this trip. In many ways, it helped reinforce much of the history I studied in college and in graduate school. I saw interfaith and intercultu ral dialogue in a tangible way that is hard to gather from graduate seminars and old microfilm. Yes, I'd studied much of these historical occupations and cultural exchanges, but in Crete, you can see it in the people, in the landscape and buildings, and in the daily custom. This is a Greek Orthodox environment where one can eat a meal in an old Turkish Hamam, look at Christian art influenced by Islam, and see Jewish traditions, distinct and yet influenced by the Muslim and Christian environment around them." I hope you've enjoyed hearing about my trip to Crete! I'm off to make a Middle Eastern roasted eggplant salad as part of our supper...I bring a little more of Crete home with me each time we go. I recently sent out an email newsletter to people who've signed up on my website and wanted to update my blog readers as well! I promise that there will be one more Crete post, likely sometime next week. In the meanwhile, I'm off to celebrate Rosh Hashanah, the Jewish New Year. I likely won't be checking in until Monday or so. Wishing you a sweet and happy 5770! There’s big news from Joanne Seiff! 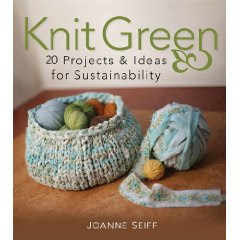 My new book, Knit Green:20 Projects & Ideas for Sustainability, will be available at the beginning of October! I am so excited to see this published! Knit Green is about sustainability in ways that knitters will enjoy and I’ve designed over 20 knitting designs that support these eco-friendly ideas. Also note: If you’re not a knitter but you wear clothing, you’ll find lots of useful information about sustainability and textiles in this book. A variety of exciting events are coming up… Please join me and I’ll sign your books, too! Join me at the Wolseley Wardrobe Fall Retreat at Delta Marsh in Manitoba! I’ll be giving a talk about Fiber Gathering and a class about knitting sustainably. Check out the Wolseley Wardrobe website: http://www.wolseleywardrobe.com/ for details. Spend Columbus Day (or Canadian Thanksgiving) with me at Nature’s Yarns in Fairfax Virginia. I’ll be teaching Taking Spinning Back to the Basics and a class based on my new book called Knit Green. Please contact the store http://www.naturesyarnsinc.com/contact.html for more information and to sign up! Going to Rhinebeck? That is, the New York State Sheep & Wool Festival? http://www.sheepandwool.com/ Me too! Please join me at Building B for the Authors Book Signing from 10AM-12PM. I’ll sign your book and hope for a chance for a chat. I can’t wait to see you there! Finally, there’s the news about me. I now live in Winnipeg! That’s in the province of Manitoba, in Canada…and I’m thrilled to be here out on the prairie. My email and website contacts are still the same, but now, I’m writing and designing in a fabulous new place. If you happen to be visiting Winnipeg, drop me a line—I’d love to see you! Thanks so much for supporting fiber arts, the festival community, and me. I appreciate it and hope you enjoy both of my books! It turns out that we happened upon one of the best folk museums in Eastern Crete while we were in Sitia. (Both of those links are to other descriptions of the museum.) When you come upon the museum, it's as if you're being welcomed into a traditional home...complete with high walls and an interior courtyard outside the house. The museum, started in the mid-1970's, was created by a cultural club. They simply went around collecting donations from people in Sitia. Up until then, many people had continued to use the things that are now in the museum. There are several different exhibits, including a traditional 19th century working class kitchen, a bedroom, a fiber arts room, an upper class bedroom, and a display of tools for working, including displays about raisins, olive oil, and other traditional village activities. The woman who spoke with us in the museum is relatively young, in her late 20's or early 30's. Despite the lack of financial support, she chose to move to Sitia from Athens, live with her grandmother, and help support the museum's mission. She was very impressive, well educated and eloquent. The details were fascinating...this is a photo of the floor design in the kitchen display. None of this was a reproduction--these artifacts came straight from members of the cultural club and the surrounding community. The kitchen was filled with interesting tools for cooking in a rural environment, including a hand operated grindstone for making flour and a sifter for sorting it once ground. There were gourds for storage and clay pots for olives and oil. Although the house itself was spotlessly clean and used as an exhibiting area only, you could tell that the tools themselves had been well used. There was an air about the place--it felt a bit like a very good housewife, efficient, clean and proud, had just stepped out. The linens were bright and clean, and the tools were all within reach and functional. There were no guard rails or ropes to keep tourists away from the displays, either. No one took advantage of this or harmed anything while we were there. The textiles were all hand done in some way. There were heavy woolen coverlets and hand embroidered towels for washing. Women in rural areas weren't educated, so one of the ways they showed their competence was through a flawless ability to create beautiful needlework. The young women created a lot of textiles specifically to prove their worth for when they married. One of my favorite stories, told to us by the young guide/curator, was about the process of weaving Gregefi (sp?) work. This is a complicated counted process which produces a reversible pattern in weaving. It requires a lot of concentration to do it right...and it's a beautiful technique. When a husband disrupted his wife when she was doing this counting of warp threads over her loom, she'd say, "What! Can't you see I'm doing the Gregefi here?!" Today, apparently people still use this phrase in a joking way. When a man doesn't want to do something in the household, or acts as though his work is so important that he can't help out, a woman might say, "What--are you doing Gregefi or something?" For those of us who get a little too absorbed in our knitting at times, this sounded entirely familiar! The "weaving" room of the museum was so perfectly done--it made me long to bring people there and to use it as a teaching tool. Crete had small household amounts of silk and cotton for spinning and weaving, as well as larger amounts of flax and wool. There were small displays for each of these processes and each was absolutely correct and well done. There were displays of naturally dyed yarns, hand dyed and woven coverlets and other textiles, and even an area where silk reeling was displayed. do all these traditional skills. Some of them still spin and weave. However, they aren't all that eager to pass along these skills, seeing no use for them in the modern era. Their children and grandchildren aren't interested in learning them. Yet, there are some who know that if they don't pass along the traditions, they won't be there for the future. It's something that's ripe for research, as the Cretan textile traditions are fascinating. The loom shown here had an ingenious leather strap system for treadles. It would be reasonably easy and possible to create more string heddles and a dd on additional leather straps as the pattern required. It seemed like the original 4 now, 4 later version for those of you who understand modern looms! It's been a long time since I wove, but I saw the immediate appeal of this beautiful handmade loom. Just as we were leaving the museum, the current president of the cultural club came in and met us. We had a fascinating discussion (she spoke in Greek, I spoke in English and the young curator/tour guide translated as necessary) about the Turkish influenced designs. Crete was first occupied by the Venetians and then by the Turks. (the Ottoman Empire) I've studied many of the Turkish sock patterns that Anna Zilboorg has researched,and gosh, I saw the same motifs in this museum! It was amazing to see the same patterns reproduced in weaving and embroidery. Are you interested in more info about Crete? I have perhaps one more post's worth of photos. After that, I'll have to go back to "regular" life here in Manitoba. So far this week, I've picked eggplant, peppers, tomatos, swiss chard and cucumbers at a U pick farm and I met a family of new Iraqi immigrants there. I've also had several other adventures...what would you like to hear about next? I'm stretching out this vacation (in my mind) for as long as I can this time!) That's because my daily life, while good, is full of things like laundry and house repairs and moving details. So, vacation is good. Let's keep talking about Crete! It wouldn't be vacation without finding fiber arts things everywhere we went. Let's start with, say, spinning wheels. There aren't a lot of spinning wheels on Crete; it's not a strong part of their spinning tradition. Spindles are shown in museum exhibits, but not wheels. However, when we were in Chania, at the very end of our trip, we were shopping for knives. Cretan knives are well known for being nice tools, and for someone who cooks lots (me) a handmade paring knife or two is a great souvenir. That said, last time we focused on a bone handle--this time, we were happy to take plastic. Plastic is easier to clean, it's all recycled from something else, and the bone was a lot more expensive. We were paying for the knives when we saw this wheel behind the counter. The flyer and bobbin were on the floor next to the wheel and the cost? 250 Euros. It was a wheel I didn't need, but an antique spinning wheel, in any event! Ok, now back to the goats... we left our car park in Myrtos (next to the goats) and took several driving trips. We went to Sitia, a city in Eastern Crete, one day. This is a pretty large, bustling place with a lot going on. Our first focus was olive oil--Sitia has some of the best in Crete-- and a good meal at the Balcony, a great restaurant. What we discovered was that the olive oil was available at the grocery store in Myrtos, so we didn't need to drive so far! The restaurant was nice, and...we found a yarn shop. We'd found others, but unfortunately, most are only open in the mornings, so I'd missed going into one. Crete mainly focuses on embroidery and lace crochet now, but I got some nice worsted weight cotton (like Tahki Cotton Classic) at a yarn shop in Sitia. I had the help of a kind Greek American woman who was also a tourist. She was from New York City, spoke very functional Greek and helped me get just the colors (navy and sage green) I wanted! The trip was made entirely worthwhile by a super trip to a folklore museum in Sitia. I will post on that soon--it deserves its own post, it's an amazing museum. As we walked through the town, we heard a sheep's baa and the professor caught a photo of this...looks like this farmer was either transporting these sheep to another farm or to market. They are hogtied, which means their legs are tied together, to prevent them from jumping out of the bed of the truck. The sheep didn't appreciate this (lots of baaas!) but it didn't hurt, from what I saw. It seemed like a logical way to transport sheep in this very hilly terrain. ..otherwise, they'd just leap right out of the truck bed! Also, one could note here that sheep on Crete are a special and primitive breed. Very tough, wily and clever, they provide milk, meat and wool--a true triple purpose breed. There are lots of textile shops in Crete with embroidered table and bed linens--sadly, most of these aren't hand done anymore, and probably not made in Crete. However, as I walked up through the town, peering into the shops, I saw what could only be a distaff, loaded with wool, and a spindle. I rushed into that shop! Most women on Crete don't spin or weave anymore. In fact, spinning and weaving were common on the island up until at least the '70's, but today, there's not much need for it anymore, with the improved availability of commercially made goods. However, this lady showed me with very little English, that she spun and wove for her own pleasure. When I showed her I too spun, she was tickled! She got out her handwoven blankets and sacks to show me. They were gorgeous! All single ply yarns, spun with the coarse wool of Crete. When I tried her distaff and bottom wool spindle, I saw what well-made and beautiful tools they were. Well balanced, and handmade! She explained that they were hers, she had none for sale. She also showed me her handmade wool combs (a lot like Viking combs) that she used to process the wool herself. She did a beautiful job of that, too. Before we left, she showed us another traditional skill. The cords used on handwoven sacks are braided/woven on a distaff like stick. The stick is tucked under one arm, and the little prongs or branches at the end are used to separate strands of yarn. The braiding is done with both hands free--this could obviously be done while walking or tending children. I was sad that we didn't have enough language in common to talk further...but thrilled to see someone spinning for fun in Crete. What a universal language we spinners/knitters/fiber arts people have! OK, back to the trip. We left the big city and headed towards Myrtos, a small town on the south-east side of the island of Crete. This is what the parking lot looked like for our hotel. Note the goats... it was just a little walk down a couple of flights of steps to the beach. You may wonder what you see on a long drive in Crete. Here are some of the sights. We took the biggest road in Crete, called the "National Road." It is usually somewhere between 2-4 lanes in both directions. There are fruit vendors and tavernas right alongside the road; easy to pull off and grab a coffee or an orange juice if you know where they are ahead of time. (big if, we didn't pull off once!) The driving on this highway is speedy like a racetrack with lots of twists and curves. We stuck to the very right side of the road! Other than this road, things are relatively unimproved. A lot of roads are paved, and may even have up to two lanes, but it's not uncommon to have goats on the road or have the whole road sort of peter out into a set of steps in a village. The truck in front of us here on the road is filled with grapes for raisins. Crete produces a lot of raisins, and it's a really labor intensive process. We had the process explained to us in a museum, but it was much more real when we were behind this truck on the highway! Summer is the dry season. Crete is very lush and green at other times of the year. However, when it is dry, it's easy to spot the furry inhabitants of Crete! This donkey was hanging out in a clearing right near a big intersection near the National Road. It was a very big donkey...it's hard to tell in this scenery, but he (she?) had some size on him! Goats are often free range in Crete. This one was very high up on a mountain above the coast road near Myrtos--eating whatever greenery was left. While we were in Myrtos, we spent time on the beach, swam in the sea, and ate well. There were open air tavernas along the beach, and it was a great spot to watch people go by. Evenings were especially wonderful. The children in town would set up plastic milk crate "stands" and put out pet rocks and trading cards "for sale." They played at shopkeeper and raced back and forth setting up stalls and taking them down. Then they got on their bikes, (all with training wheels) chasing each other (gently) up and down the pedestrian walk way, honking their horns and ringing their bells. Puppies and children ran up and down the beach, sometimes getting in one last swim. Best was the pair of little boys, one sporting sunglasses, who went fishing at dusk together. They didn't let the sunset or the dark get in the way of the sunglasses look! We stopped along the highway to see these ancient mills. They've recreated how the mills worked along this road, so you can see how the wooden spokes would have turned the gris tmill inside through windpower. Turns out wind power is a pretty ancient energy source! There are other mills on hillsides, but they lack the wooden spokes, so you need to know what to look for in terms of building shape when you glance up. Time is elastic like a rubber band when you have jetlag. On one hand, we've accomplished a ton since coming home...a Manitoba driver's license and license plates for me, a lot of errands and house fix-its, canning chutney and plum sauce, etc. On the other hand, it took me 4 days to get the camera, its battery, and the little cord that hooks it up to my computer in the same room. It took me a while to upload photos...and thus, I've delayed telling you about all the Greek adventures. Oh, and we got our luggage back, no problems, it was only a day long excursion to Chicago, apparently. Now I'll narrate all these photos. At the conference the professor attended, they always have a traditional Cretan dance performance on the last night, including live music, lot s of raki to drink, and friendly companionship. The professor and I enjoyed it all but went to bed relatively early, which was all for the best! One thing that occupied me during the conference was a small black puppy that was living on the beach below the conference center. It had been abandoned and had created a den for itself in the vegetation on the beach. It didn't let me get close, but it did allow me to feed it quite a bit of meat--I left it, like offerings, right near its den. An old man who spoke about 5 languages (but not English) told me, in French, that yes, the puppy was being well-fed. Hopefully someone will be able to coax it out and give it a home. After the conference, the professor and I had a few days of holiday on our own. We rented a car and headed to Rethymnon for a night. In Crete, history lives right alongside modernity. So, you can see a Venetian townhouse (from the Venetian occupation) right next to an Ottoman-era mosque (Turkish occupation) or graffiti or a kids' playground. It's a really interesting hodgepodge of ancient and modern. Gardens also flourished right in town. From our room on the third floor of an old Venetian dwelling, we can see the city, the mountains beyond, and this amazing empty lot, made into a huge garden space. Peach, orange and pomegranates flourished, as well as every other kind of warm weather garden produce. This is to the right of the view. Just on the other side of the wall, the neighbors live in three separa te stories. Their garden, thick with oranges and flowers, is in a courtyard off the street, where the whole family (3+ generations) gathers for meals. In the courtyard of the hotel, we had breakfast beneath this awning, surrounded by grape arbors and cool shade. To the left, also in the same courtyard, was an enormous formal pool, filled with koi. We ate at two different restaurants while we were in this city. Both had courtyards filled with lemon trees. We sat beneath the citrus and had long leisurely meals under dappled light. Next time, I'll show more pictures and draw this out so you can imagine more of the adventures! I did indeed finish the socks pictured in the last post. I didn't finish much else, as the roads are mountainous and so windy that it's hard to knit in the car. I did see lots of other treats in the meanwhile, though. Now I'm off to meet my new doctor...I'm entirely healthy, but want to have a family doctor just in case. Oh, and it was easy to get an appointment and his office is around the corner. So far, I'm liking Canadian health care...It took me a year to find a doctor in Kentucky, where there's something of a primary care doctor shortage.